Generally, when creating a sports licensed design you have to make “cookie-cutter” layouts that work for various logos and text that will differ in shape, size and color. On top of that, the artwork needs to meet the “design rules” of specific teams and leagues. For hot-market jobs there is also the added event style guide (Super Bowl 50) and/or event sponsor that you must adhere to. Planning all of this out will allow your master template design to work for all the sports teams needed. With all of these do’s and don’t’s, this is what makes designing for a hot-market project challenging. 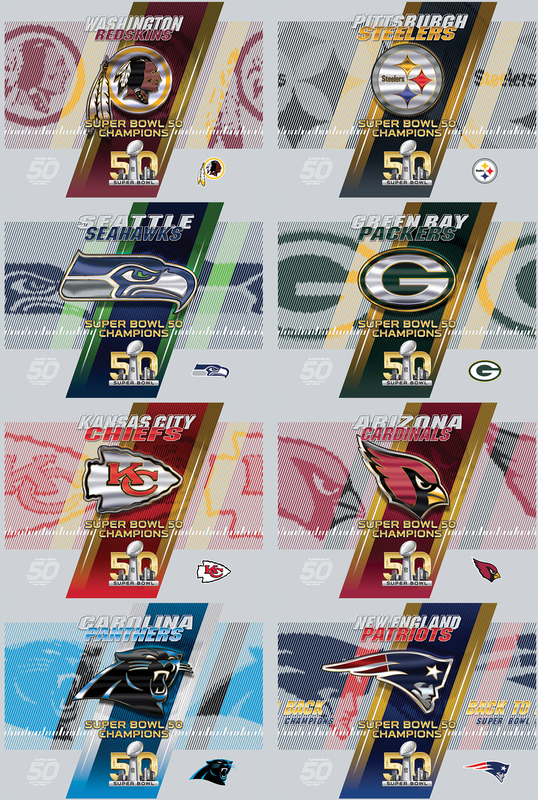 So here was my attempt in creating a solution that fulfilled the client’s direction, complied with all the guidelines and in the end, a design that looked like it was exclusively made for one team, the victors of Super Bowl 50. With a Hot-Market project you have some wiggle room since you are ultimately creating just one design (for the team that wins). However, there are other challenges and steps that will effect the way you design. To have the product ready to sell at the moment the confetti begins to fall means a lot of extra work. Once the creative direction is set and all the assets are received, we can begin. This includes the copy, the latest team logo style guides, any other imagery and the product legal lines. Usually the delivery of these assets is piecemeal and you learn to plan your designs and layouts accordingly. Due to the nature of hot-market projects there are usually more logos and more copy to layout (team logo, event logo, team name, team city, location, dates, etc.). 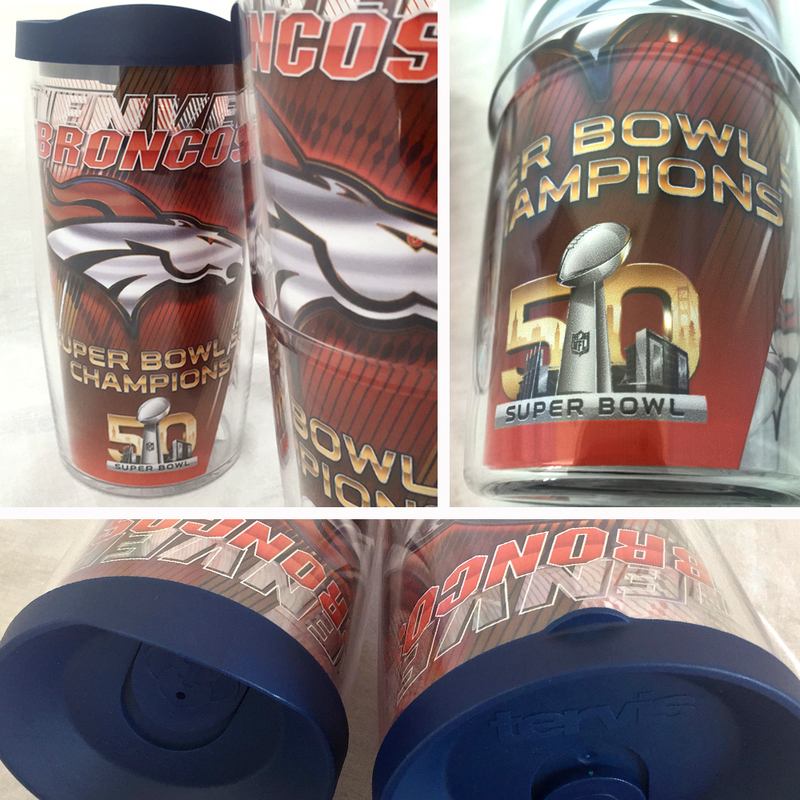 Tervis chose the Carolina Panthers as the initial team to comp up. The team that is chosen is usually the favorite to take the title but as you will see you have to cover all your bases. The images above show a few ideas flushed out after a couple rounds. Once the chose design was picked the next step was to do some fine-tuning. Following the art direction I create a couple options on how to treat the team logo. We also explored the team name font, stripe layout, use of team color and all the secondary logo placements. Below shows the final three options. Hot-market means that we need these products ready to go once the Super Bowl results are final and one team is crowned. So as the project moved along the client needs to see the teams who were still alive in the playoffs. So each team needed to be flushed out. This means every design element must be noted and built to be streamlined. Frome the logo and type treatments to switching out team colors piece of the puzzle needs to be production-friendly. With so many rounds, versions, teams, files, layers and assets you must have great file organization or you’ll go crazy. To add to all this with the Patriots possibly having “Back to Back” championships we need to build a unique design for the added callout. The above artwork was created like a Ford assembly line. To be efficient as possible every element for all the designs were done at the same time. For example, each team name had to be sized, kerned and adjusted to the fixed width prior to coloring and added any effects. Doing every team at the same time not only saves you time but keeps the look consistent. And if the client makes one slight change to this element, you need to re-create this all over again. The side team logos (the angled half-tone lines) took about 11 or 12 steps each moving between three different programs to create, oh what fun. To get the effect and play with the transparent nature of the product (clear tumbler), it was well worth it. By the way, props to all production artists! As the deadline approached and teams got eliminated, along with the week off between the conference championship games and the Super Bowl, I had to create final, approved, production ready artwork for just two teams. And with this job needing artwork for two different tumbler sizes (16 oz and 24 oz), that meant four separate files. No, it wasn’t a matter of just scaling the art (I wish) as the 16 oz versions are not proportionally viable. 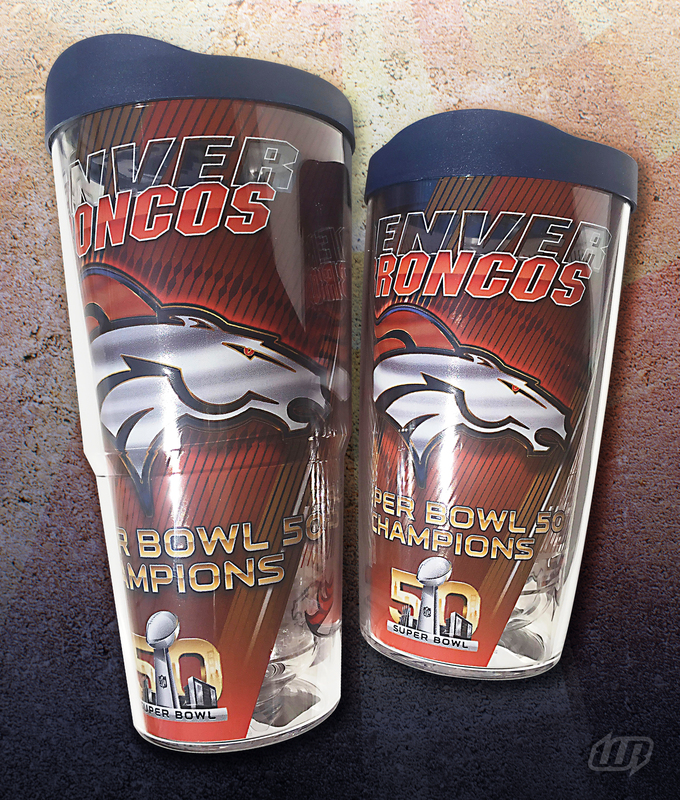 Below shows the final artwork for the Super Bowl champions, Denver Broncos (prior to curving for the tumblers). In the end, all the extra work I did for all the other teams would never be seen. That’s just the nature of these jobs. It could be worse. I worked for a company that created those championship caricatures tees for the four major sports. That meant taking the time and effort to draw caricatures of a lot of players for multiple teams with ultimately only one shirt being produced. So there were four Buffalo Bill championship tee designs that were illustrated, sampled and produced… but were never sold. I wonder how much those would be worth?